New Delhi: Two persons were killed and 17 injured when a portion of an underconstruction bridge of the Delhi Metro collapsed and fell on passing vehicles, including a bus, here today. 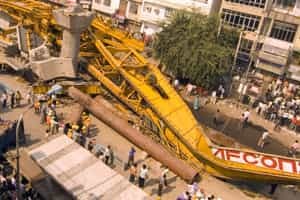 The incident took place on Vikas Marg in east Delhi’s Lakshmi Nagar locality at about 7:05 am when workers were lifting a 400-tonne concrete span of the bridge with the help of a crane. The launching system developed some mechanical fault leading to the collapse of the 34-metre-long span which fell on a blueline bus, crushing the driver Surender Kumar to death, a senior police officer said. Two trailers, which were being used for launching the span, and two cars were also damaged in the accident which blocked the two-way traffic on Vikas Marg. “It is a big shock to us. We are taking it seriously and we are for an independent high-level inquiry into the incident," Delhi Metro spokesperson Anuj Dayal told reporters. According to Dayal, a 28-year-old bus driver and 25-year-old Chotte Lal, a labourer were among those killed. Seven of the injured were rushed to Lok Nayak Jai Prakash hospital while two others are being treated at the Hedgewar hospital at Karkadooma. “I was sleeping and woke up hearing a huge sound. I thought it was an earthquake and rushed outside only to see the bus under the debris," said Anand Kumar, who lives near the accident site. Delhi Metro announced a compensation of Rs5 lakh for the family of the deceased, Surender Kumar, and Rs50,000 for the injured, besides medical treatment.